Be Scrappy Quilt Color(s) of the week! 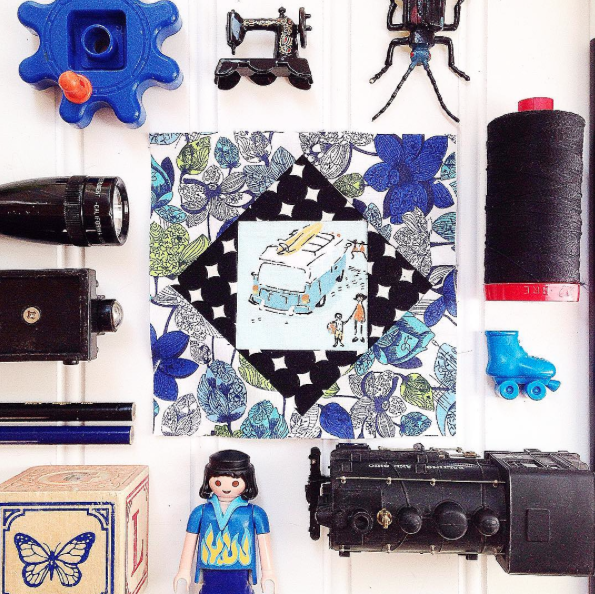 This week for #bescrappy on Instagram, Susan has chosen the combination of Blue and Black! I am still working on Economy Blocks. They are completely addictive! Be aware that once you start this awesome scrap busting block, you will not want to stop! For the blue/black theme, I found a delightful Liberty of London to surround a very bold black and white print to make the Heather Ross fussy cut even more fun! Check out my previous post on how to make your fussy cuts perfect! If you are sewing along with our scrap busting fun be sure to use the hashtag #bescrappy and also tag me ( gogokim) and Susan (Yardgrl60) in your post! We love to see how you store your scraps, what blocks you are making that are FAB scrap busters, and how you decided what to toss or keep in your scrap stash! I'm really loving this block. I have heard of the Economy Block before but these are really speaking to me! Thanks for the inspiration!